Answer: You’re the 5th reader to ask about Planet 9, so it’s probably high time I addressed this new discovery. First thing you need to know is that, at present, the evidence for Planet 9’s existence is indirect. But it does have astronomers looking for it with the most powerful telescopes on Earth and in space. 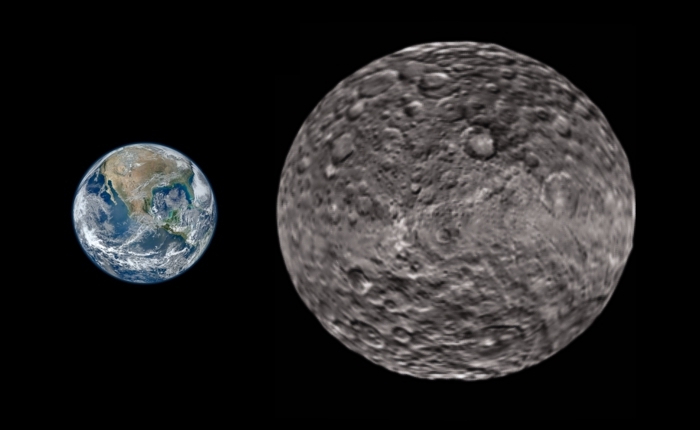 The graphic shows a size comparison between Earth and Planet 9, but uses a doctored image of the asteroid Ceres (a world of rock and ice). We expect objects as distant as Planet 9 to have this composition. And yes, I know those are extremely large craters at the scale of this graphic, but an enlarged Ceres works for my purposes. In a 2014 letter to the journal Nature, astronomers Chad Trujillo and Scott S. Sheppard speculated about the possible existence of a large distant body that could meet the current criteria for a ninth planet. Their hypothesis was based on the statistically unlikely fact that six known trans-Neptunian objects (TNO’s) had unusually-aligned orbital motions that could be explained by the gravitational influence of another massive TNO (Planet 9). But nobody has yet imaged it directly, and that is required for the IAU to assign an official name. Nonetheless, just for convenience, astronomers have been using several unofficial names to talk about it. Those names include: Planet 9, Perturber, Jehoshaphat, Phattie, and George. Of those, only Jehoshaphat would have a chance of being approved by the IAU. So astronomers have some reasonably good numbers to aid them in their search, but Planet 9 is very far away (20 times the distance of Neptune) so it would be a very faint object. If our assumptions about its composition are correct, and knowing the reflectivity of rock and ice, then Planet 9 would have a visual magnitude of around +22. We may already have images of Planet 9 in the archives from all-sky telescopic surveys. It wouldn’t look like more than a point of light, but by comparing images taken at different times it could be identified by its motion relative to stars in the background. Such a search is currently underway. That’s all we know about Planet 9 at present. When it is confirmed, and if it meets the official criteria for planet, then our Solar System will be back up to nine planets. Of course, at Planet 9’s great distance, another planet could later be discovered closer in. Future discoveries could “promote” Planet 9 to Planet 10. Alas, Pluto will never regain planet status unless the IAU changes the criteria for planethood.